Seventy people who do not know each other will meet for the first time and get an opportunity to extend their passion. How this happens is an interesting story that unfolds on a 900 kilometre bicycle tour. 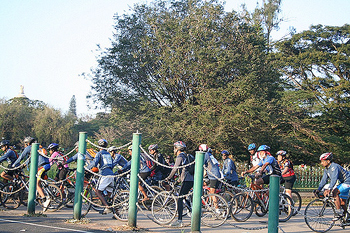 Seventy cycling fanatics from across the country, including 11 women, will participate in the second edition of the BSA Tour of Nilgiris, one of the most demanding bicycle rides in the country. Starting from Bangalore and winding through Mysore, Hassan, Madikeri, Irupu, Sultanbathery and Ooty, the tour cuts across forests, mountains, and coffee and tea plantations over eight days. 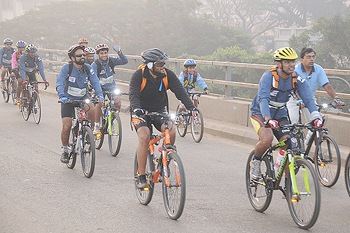 Ravi Ranjan and Rajesh Nair, founders of the tour, say it is a great opportunity to cycle in the company of those with a passion for cycling, who appreciate what is going on. The number of participants has risen to 70 this year compared to the 56 in 2008. Woman participation too has grown from four to 11. The event started off with a couple of friends going on an excursion. The same gang thought it would be great to make the trip more challenging. There was a core group of eight people at first and slowly the list started to grow, with friends of friends wanting to take part. Basically, it was a set of people wanting to participate in a challenge on their bicycles. The organisers point out that it is fairly a complex tour -- said to be India's longest -- which goes through roads and mountains as well. It has already started attracting people from across the world, including US and Israeli nationals. 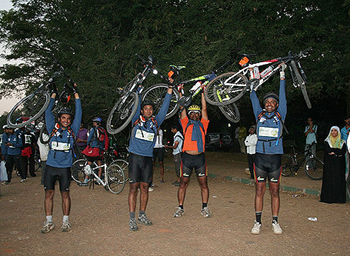 Apart from having a passion for cycling they also want to discover the bio-diversity of the Nilgiris and study the culture of three different southern states which they will pass through. The day starts at 5.30 am with briefing over a high-carb breakfast, where each is told about the route to be taken. A route map shows each village the riders will pass through. Apart from this they are also told about the dangers along the course and where not to cycle. Suma Rao, 40, a freelancer with a recruitment agency says she has a wide range of interests involving the outdoors (rock climbing, trekking wind surfing, running), pottery, and bird watching. "I am looking forward to the ride for the challenge of the ride, as well as travelling through the Nilgiris on a cycle with like-minded people for company," she says. 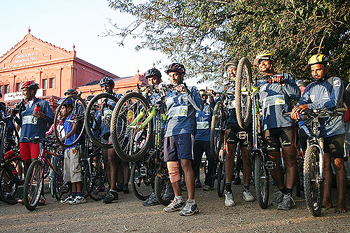 The women have already started preparation for the ride by doing 80-100 km rides on weekends, 30-40 km rides on weekdays. The organisers say that anyone who has a mechanically sound bicycle and physical ability to ride around 100 to 120 km a day can join in. To be on the tour one needs to make a donation to the RideACycle Foundation as part of the tour. The RAC-F uses this to promote cycling and other activities and events like TFN. Safety measures: The organizers have ensured that safety will not be compromised at any cost. There may be a few who will not be able to complete the entire course, and for them a sweeper will come at 1600 hours and take them to their destination. The cyclists will set out only when visibility is high. Along with a rider docket, a high carb protein pack will also be provided. Apart from this there are support stations along the route. An ICU on wheels, with a 24-hour nurse and doctor of fitness and lifestyle medicine, will also accompany the cyclists. The cyclists will also have a support team of motorcycles along the way and an SUV with spares and mechanics on board following. There is also a rest day when the riders have the services of a masseur. The rest day will also see the cyclists take part in a course on photography. The Tour certainly has some unique characters on board. Take the case of Sridhar Varadaraj, 40, who runs a technology business. He wants to celebrate his birthday by going on the ride. "I am doing this ride at a time when I celebrate turning 40; it feels like coming back full circle to do such a fantastic tour in the Nilgiris from where I have some of the fondest memories of my life," he says. 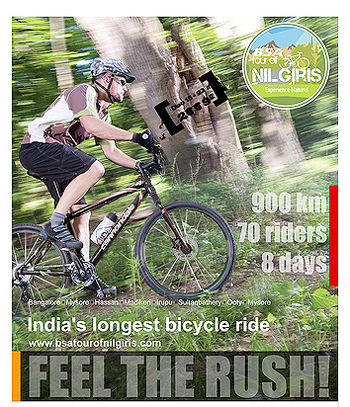 Ravi Ranjan Kumar, 32, co-founder, Tour of Nilgiris, says that the TFN is a dream came true. "I wanted to go though these scenic routes slowly and enjoy the beauty of it. Every time I wanted to go on a ride, it was by train to those 'Blue Mountains'. I came across people with similar thoughts, and here is TFN and we are going again. "In TFN 08, while scaling those mountains, I was with people who had the same goal: to challenge the body and purify the soul. I made friends with these people -- and discovered I was not the only crazy one." For Ullas Holla, 30, who writes code for SAP Labs TFN 09, it is a dream come true. "Around this time last year, I stumbled upon discussions of TFN 08 and fell in love with cycling all over again. Riding in TFN 09 became my personal Everest. Having never done anything of this proportion before, I relish the physical and mental challenges that lie ahead. Over 900 km of riding pleasure, with like-minded bikers, in terrain dotted by scenic views and beautiful villages with their people and cattle galore, not to mention enjoyable weather. I can't wait."